I've only been around since '49 but was still amazed at my young age how he could take a simple line and construct an entire object from it...I've always wished I had that kind of talent...I believe you have to have that inherentlky inside of you - you cannot 'learn' it...I can see - but can't make what I see with my eyes transfer to a medium through my hands. The show ran till Jan.17,1950.I always amazed was he could do with a picture.I've been around since 47. I can remember that...it was not in color and I think his last name was Nagy, or something like that! One of the first TV shows I watched as a kid (born 1949)...he'd take lines or other shapes allegedly sent in my kids my age and draw something identifiable from it...I have a hard time finding folks who remember this....and I AIN'T OLD!!! on WNEW TV Ch.5 in NYC. 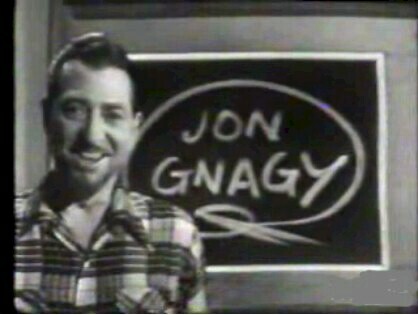 Gnagy may have a place in history as the first performer on the first commercial network TV show ever broadcast. According to some accounts, this occurred on May 14,1946, when New York City's NBC outlet, WNBT (4), aired Radio City Matinee. After introductions by emcee Warren Hull, Gnagy said, "Hello, friends, this is Jon Gnagy to prove to you that you can learn to draw by following my step-by-step lessons. Today we're going to draw this picture of an old oak tree...." He picked up a crayon, but found that it had melted under the hot studio lights. Calmly, he substituted a piece of chalk. Learn to Draw was also known as You Are An Artist.